The HSE Shattered Lives campaign reminds us that slips and trips are the biggest single cause of accidents. Each year there are thousands of serious slip accidents in the UK. One serious accident every three minutes. We'd like your help to prevent many of those accidents. Please contact us if you have ideas to prevent slip accidents or to tell us how you keep your floors clean and safe. We have been working with our customers and partners about the best ways to prevents slips and falls. We have spoken with colleagues at HSE, HSL and BRE. We have spoken with H&S directors at local authorities and top retailers. We have spoken with flooring manufacturers, flooring treatment suppliers, health and safety consultants and even those who write the British and European Standards. With all of the above input we have devised 10 easy steps to reducing slips and falls. Please use the above as a start point for developing your own floor safety regime. Please consult with the very best suppliers in floor safety, flooring, anti-slip and with your H&S Adviser.If you need help to reduce slip accidents, then please contact us. Now we need your help to take action to reduce slip accidents. Contact us for details. 241 workers were killed at work, a rate of 0.8 per 100 000 workers. 141 350 other injuries to employees were reported under RIDDOR, a rate of 535.1 per 100 000 employees. RIDDOR accidents are the tip of the iceberg as only a tiny proportion of serious accidents must be reported. For example in a school if a teacher is seriously injured it may need to be reported, but the same accident to a pupil or anybody in the school who is not an employee may not need to be reported. The same applies in every place of work. 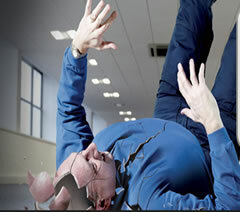 Accidents that result in serious injury to an employee must be reported. But the same accident to anyone else may not be reported unless they are taken directly to hospital. So in a train station, leisure centre, hotel or anywhere that people vastly outnumber employees, the RIDDOR statistics may significantly disguise the number of serious injuries. There are 40 minor slips for every serious accident. Each minor slip is an opportunity to prevent a serious accident. Some minor slips are just genuine accidents but one could be the first sign of an accident black spot, an area of floor that has become dangerous... an accident waiting to happen. We have been working with many partners throughout 2008 to develop a set of guides to floor safety and preventing slip accidents. We'd like to share that information with local authorities, schools, healthcare providers, leisure facilities and commercial businesses. We are happy to work with your Health & Safety Manager or your H&S Advisor to provide them with free advice to improve floor safety. Contact Jenny if you'd like to know more. The UNSHATTERED initiative is open to all. We will be inviting a wide range of organisations with an interest in reducing slip accidents to participate. We will publish a practical floor safety regime, freely available to all participants. You can use this floor safety regime to measure and reduce accidents in your organisation. For more information about this initiative, please watch this space, or if you'd like to help save 50,000 serious accidents then contact us. Please contact Jenny now to register your interest and support for this initiative. In the UK there are over 150,000 serious slip accidents each year. Most of these could be prevented. These useful posters can be personalised with your local safety rep information. Too many businesses have acquired the habit of waiting until a serious accident happens before they take slip assessment seriously. This costs over £512 million per year and results in injuries that could have been prevented. If your floors are unsafe then HSE HSE inspectors may be called. Your local authority can close your store or restaurant or hotel if the floors are not safe. Regular testing is easy, inexpensive and a lot safer for staff and customers and especially for you! With your help we'd like to prevent 50,000 serious accidents by 2012. We'd think it is possible to reduce RIDDOR reported slip accidents by 1000 per year by 2012. Contact Jenny if you'd like to help save some of those shattered lives. This image is published with the kind permission of the UK HSE who own copyright of all Shattered Lives images. The HSE Shattered Lives campaign reminds us how serious slip accidents can be. In the UK there are thousands of serious slip accidents each year. Most of these could be prevented. Slips account for over 600,000 hospital bed days each year. Use SlipAlert each time there is a minor slip and you can tel if the floor is safe or an accident waiting to happen. Then you can start saving accidents and preventing shattered lives.